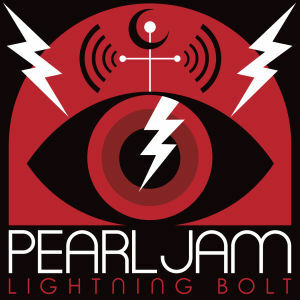 Pearl Jam – Lightning Bolt | NoCoda. What It Sounds Like: The ever-evolving PJ show no signs of slowing down on their tenth record. If 2009’s Backspacer was their pop record, then Lightning Bolt is another incarnation of it, but with a more serious tone. Eddie Vedder is pushing the big 5-0, but you wouldn’t have the slightest clue by the way snarls through the punk jam that is Mind Your Manners, single number one off of Lightning Bolt, a record that comes to us a whole twenty two years after their debut, Ten. Try my patience / My patience tried / This world’s no longer good enough / That makes me wanna cry he blares with enough guts to tear down the Walls of Jericho. Any support structures come crumbling away as we veer into the follow up, My Father’s Son. Vedder takes full-on aim as he unleashes his cannon: Can I get a reprieve? / This gene pool don’t hurt me / Can I beg a release? / From the volunteer amputee . The sun starts shining on the title track, which is energy in motion personified, within every sense of the phrase, while Swallowed Whole, Infallible, and Pendulum are steeped in the classic PJ sound, either unleashing themselves just enough to be dangerous, or restraining themselves enough to make their teeth glare even sharper. No doubt though, that Pearl Jam wouldn’t try something a little new: we find it here with Let The Records Play, a back-and-forth bass riffer that shows us an old drunk that that knows the only cure (besides another round, of course) is dropping that needle, once again. There’s wisdom in his ways, Vedder sings, before Mike McCready blasts into a guitar solo. Speaking of McCready, it would be an unimaginable sin to overlook his one solo contribution to Lightning Bolt as a single songwriter. It’s takes its form as the album’s second single, Sirens, and its about as solid of a love song as Pearl Jam has ever put to tape. Not a love song in the conventional way of course, but one that I, personally, would gladly, tearfully, and wholeheartedly want a couple to spin as their first dance as husband and wife. Lyrics are essential. The music only will transcend you higher when combining the two. I hear the sirens / More and more in this here town. Let me catch my breath to breathe and reach across the bed. Just to know we’re safe / I am a grateful man. This life has been a light and I can see you clear. Oh, I have to take your hand and feel your breath. For fear that someday we’ll be over. The sound echoing closer / Will they come for me next time? Oh, it’s a fragile thing / This life we lead. With death over our shoulders. I always loved you / Held you high above too. I studied your face / And the fear goes away. If that doesn’t give you a big-picture view of what love is, I don’t know what’s gonna do it for you. McCready’s delicate lyrics paired up with Vedder’s passionate delivery, backed up with moving mid-tempo instrumentation make for a latecomer in the race for track of the year, but there’s no denying: it’s got a very good shot at being just that. I don’t like going through reviews of records from the top down, but that’s kind of the way this one panned out. Sleeping By Myself was better suited to Vedder’s 2011 solo Ukulele Songs, but it’s anything but a throwaway. Yellow Moon (classic Pearl Jam), and Vedder’s solo write on the closer of Future Days (another beautiful love song in its own right) are epic winners. I say it again: ten records in, and Pearl Jam are still cranking out good-as-gold records, from top to bottom. This isn’t just an essential disc for PJ lovers – it’s just as essential for the protagonist in Let The Records Play as it is for the 13 year old who just picked up his first guitar. Quality, through and through.